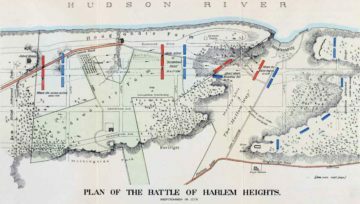 The Continental Army held a series of high ground positions in upper Manhattan. Immediately opposite was the vanguard of the British army. 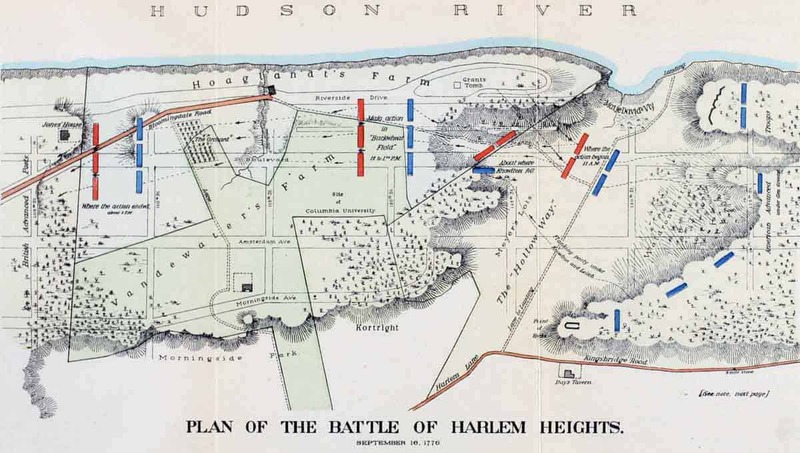 An early morning skirmish between an American patrol of Knowlton's Rangers and British light infantry piquets developed into a running fight as the British pursued the Americans back through woods towards Washington's position on Harlem Heights. The overconfident British, having advanced too far from their lines without support, had exposed themselves to counter-attack. 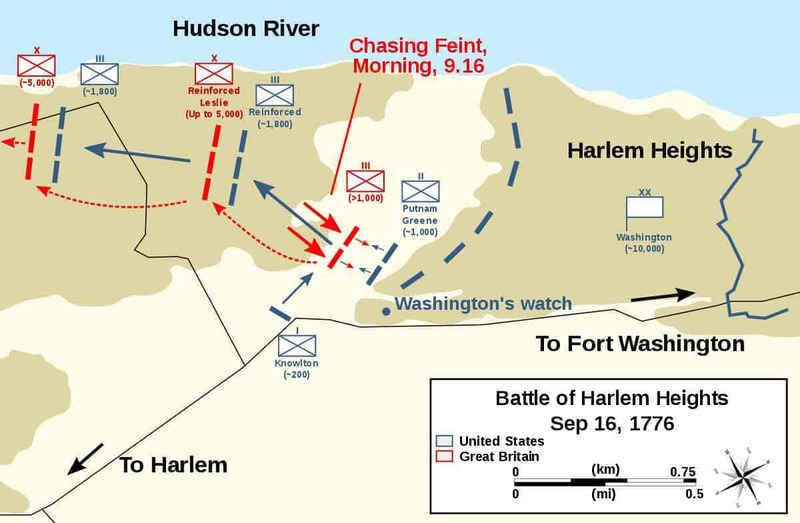 General George Washington ordered a flanking maneuver which failed to cut off the British force but, combined with pressure from troops arriving from the Harlem Heights position, succeeded in driving them back. Meeting reinforcements coming from the south with artillery support, the British light infantry turned and made a stand in open fields on Morningside Heights. The Americans, also reinforced, came on in strength and there followed a lengthy exchange of fire. After two hours, with ammunition running short, the British began to pull back to their lines. Washington cut short the pursuit, unwilling to risk a general engagement with the British main force, and withdrew to his own lines. The battle helped restore the confidence of the Continental Army after suffering several defeats. It was Washington's first battlefield success of the war. After a month without any major fighting between the armies, Washington was forced to withdraw his army north to the town of White Plains in southeastern New York when the British moved north into Westchester County and threatened to trap Washington further south on Manhattan. After two defeats, Washington retreated west across the Hudson River. Armies - American Forces was commanded by Gen. George Washington and consisted of about 2,000 Soldiers. British Forces was commanded by Gen. William Howe and consisted of about 5,000 Soldiers. Casualties - American casualties were estimated to be 30 killed and 100 wounded. British casualties was approximately 90 killed and 300 wounded. Outcome - The result of the battle was an American victory. The battle was part of the New York and New Jersey Campaign 1776-77. 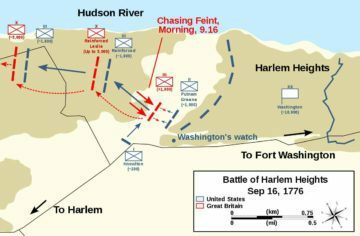 The Americans, under Washington, Brigadier General Nathaniel Greene, and Major General Israel Putnam—held a series of high ground positions in upper Manhattan against an attacking British division under the command of Brigadier General Alexander Leslie. British troops made what became a tactical error by sounding a fox hunt bugle call while in pursuit, meant to insult the Continental troops, who were in orderly retreat. This instead infuriated the Americans, who galvanized to hold their ground and rallied for victory. On September 15, after the British landed at Kip's Bay, General William Howe and his army advanced on the east side of Manhattan while the Americans advanced on the west side. 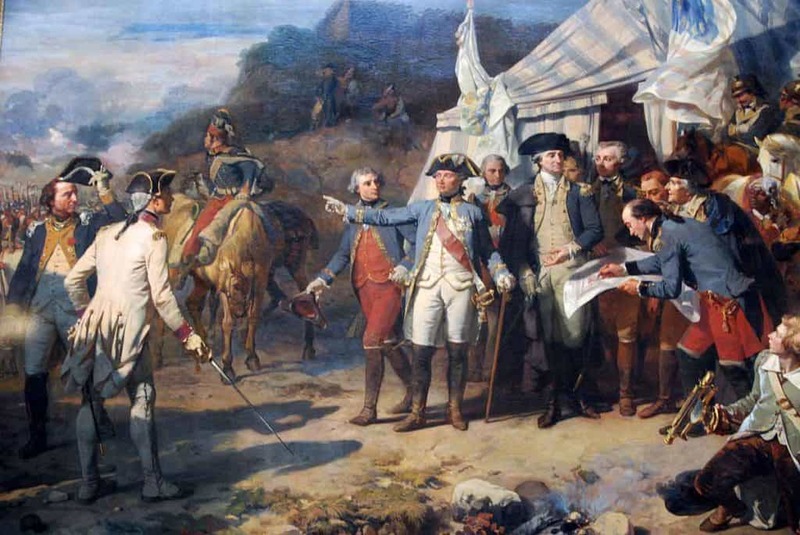 On September 16, Washington was in considerable anxiety at the inability of his troops to stand up to the British and Germans of Howe’s army. Step by step, the Americans were being driven off the island of New York. Washington now held only the northern plateau of the island, around the fortification of Fort Washington on the Hudson shore. Washington sent a party of New England Rangers, under Captain Thomas Knowlton, to scout the British movements to the south of his position. He descended from the northern plateau into an area of lower ground known as the Hollow Way and on to the next plateau. There, his party of around 120 men encountered the British light infantry pickets and firing broke out. More British troops came up and the small party of Rangers was forced to retreat in some haste, with the British in pursuit. It is said that the Americans on the northern plateau were particularly enraged to hear the British using derisive fox hunting calls. Washington ordered a force forward to lure the party of British further onto the plateau, while a second force moved around the British right flank and cut them off from the southern plateau and further reinforcement. The British took the bait and moved further onto the northern plateau as the Americans fell back before them. As they moved south, the American flanking party encountered some British troops and firing broke out, warning the light infantry that they were in a perilous position. The fighting ranged north before Washington decided to send troops forward in two flanking maneuvers, one under Major Andrew Leitch and the other under Knowlton. A third force of Americans made a feint to attack the British in their front. One of Howe's subordinates made a critical mistake during the fight. A fox horn was sounded before the fight was over. A "Fox Horn" was used by fox hunters and signaled to other hunters that the fox had given up and was ready to be killed. The American force heard the horn and all this did was to motivate the men to fight even harder. 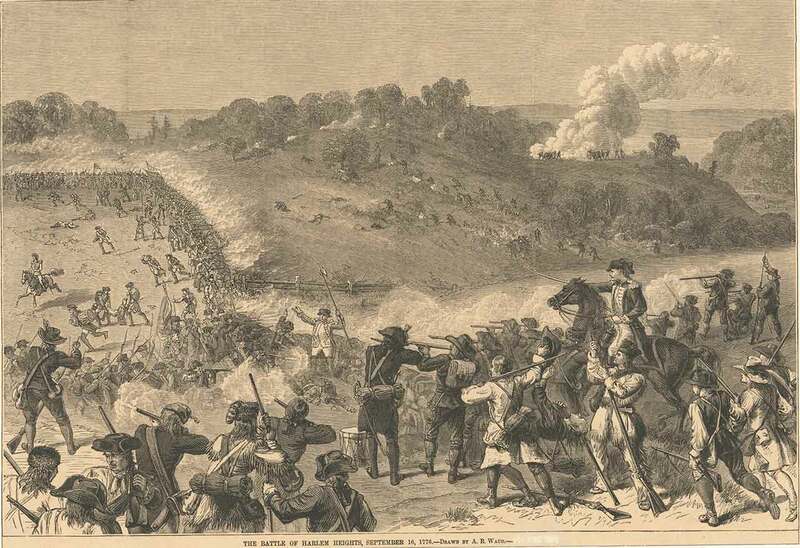 Although the Americans attacked before the British were surrounded and Leitch and Knowlton were both mortally wounded, the British found themselves attacked on three sides and began their retreat. Under persistent attack, the British retreated to a field in the Hollow Way. The fighting continued for an hour until the imminent arrival of more British forces. This caused Washington to call his troops back. The number of troops grew to nearly 5,000 on each side as the British were pushed back. Washington called off the attack after 6 hours because the Americans were not ready for a general engagement with the full British army. The importance of this battle for the Americans was that it was the Virginia militia who had fled the British the day before, who fought steadily and effectively alongside the Northern Rangers, going a long way to restoring the confidence of the American army in itself. There was little fighting for the next month of the New York and New Jersey campaign, but Washington moved his army to White Plains in October after hearing that the British were attempting to trap him on Manhattan. After being defeated at the Battle of White Plains and later at the Battle of Fort Washington, Washington and his army retreated across New Jersey, pursued by the British, into Pennsylvania. The loss of Knowlton was a blow to the fledgling American intelligence operations, as he had created and led the first such unit of the Continental Army, at the direction of Washington.